There's no doubt that what's going on outside, particularly with Mother Nature, affects what's going on inside, particularly with our motivation and Creative Spirit. I admit to sometimes being affected myself. But I think it's also a wake up and cool down call. When I say 'Enjoy the Sunshine Inside and Out!' this is a great example. Since the sun is not shining outside (at least not now that we're having unusually winter-like weather here in the Bay) it's time to create our own sunshine. Warm things up and shed a bright light on them. 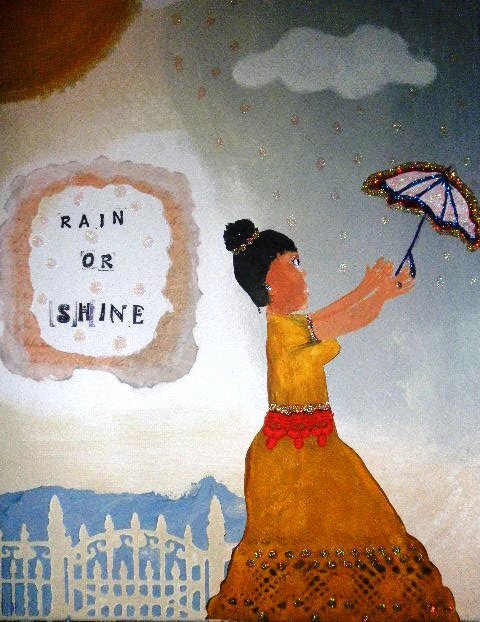 The above picture called 'Rain Or Shine' was created using paste, acrylics, freehand drawing (the lady), rubber stamps, gesso, acetate, glitter, ribbon, archival ink and the fence is a 'Glimmer Screen'. It did brighten my Spirits. It did allow me to go to that 'Creative Space' I search for. It did allow me to create something a smidge different from my usual. And that's why I call it 'Healing Art'. Point... don't let what goes on outside affect what's going on inside! Have a great day! And Create!